We finally got our new camera this past week! (Caleb has his toy and now I have mine.) We had been waiting to order it because we were out of town for most of May it seems. Now I have it in hand and am trying to figure it out! 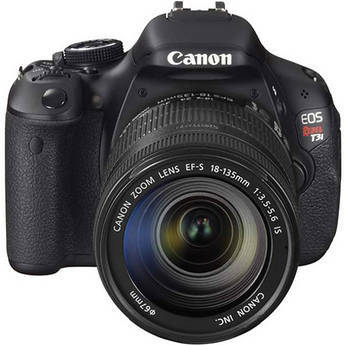 We got this Canon Rebel T3i with an 18-135 mm f/3.5-5.6 IS lens. To be completely honest, I don't really even know what that means. I was clueless about what kind of camera we should get, but our amazing wedding photographer suggested this one for what I'm looking to use it for. Now I'm in the process of reading the manual, learning the settings, and practicing shooting! Does anyone have any tips for me? Are there any settings or features that that you love on your SLR? Anything I should definitely know as I'm trying to figure everything out? Or has anyone read any good books on shooting with an SLR? I would appreciate all the help I can get! I have the Canon XS which I think is a few versions down from yours but I love it! I just love how Canon pics turn out! yay! camera's are so fun..... have fun playing with it and figuring it all out! I have been wanting a new camera myself!!! :) I have to save up a bit but I really love yours!!! I want one similar! Just not sure which one yet. i have the rebel too aqnd i love it - but i must admit, i've been extremely lazy in learning how to use all the features. it is one of my goals for the summer. yay so happy for you, can't wait to see how the pictures turn out! i myself have the rebel xsi, and im telling you, canons are amazinnng. no tips really considering the quality is so great it looks amazing no matter what. just experiment, you figure it out fast. Can't wait to see what you come up with! I'm learning my fiance's DSLR so if I figure anything out I'll make sure to share. I'm so excited for you! Isn't it the best getting a new camera?! I can't wait to see all of the pictures that you post with your new toy! Have heard such great things about this camera! I have no idea on tips and such, my beau does that side of my blog! But you'd be surprised at the free tutorials on youtube. Have a look, you may be a pro by next week!! I do want a new camera but I don't know where to start. I am going to keep up with you revelations on this camera. I have the canon rebel T1i! I love mine! I think yours is a little better though. Such a great camera. Having a good lens make the world of difference. We're thinking about purchasing a new camera too! How are you liking this one? Is it easy to learn and use?